Win In Like Flynn: Errol Flynn's early adventurous life | SWITCH. Whilst serving as a guide for a Hollywood producer in the jungles of Papua New Guinea, young Errol Flynn discovers a trail leading to a fortune in gold. With three fellow opportunists he sets sail in a yacht stolen from Chinese opium smugglers on a quest to find hope, adventure and fortune at a time when the world was spiralling into despair. 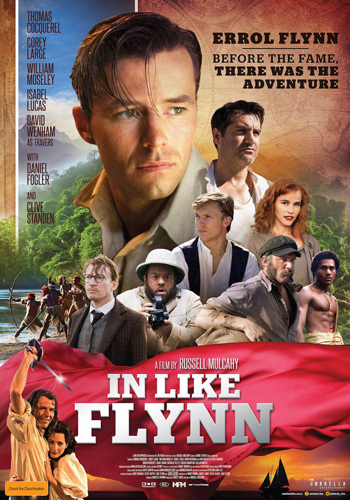 'In Like Flynn' stars Thomas Cocquerel as Flynn, with Corey Large, William Mosely, Isabel Lucas, David Wenham, Dan Fogler and Clive Standen. The 'In Like Flynn' competition has now closed. Winners will be announced shortly. Competition opens at 5pm AEST on Sunday 30th September 2018 and closes at 11:59pm AEDT on Sunday 7th October 2018. Five winners will be chosen at random on Monday 8th October 2018. To successfully win, entrants must fulfil the above entry conditions before the time the competition closes. Current members/followers are eligible to enter the competition. Only one entry per person. Only one winner per household. To be a valid winner, the entrant must not have won a prize from SWITCH within the last 28 days. Each winner will receive one double pass to 'In Like Flynn'. By entering, you agree to receive occasional emails from SWITCH in the future. If you decide to unsubscribe from these updates, any further entries will not be applicable. Only Australian residents are eligible to enter. 'In Like Flynn' is in cinemas from Thursday the 11th October 2018 through Umbrella Entertainment.